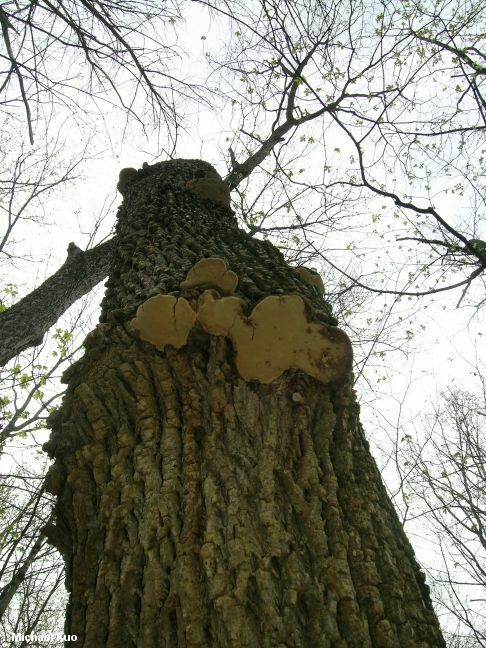 Often overlooked because it tends to grow high on the tree trunk (and frequently ignored by collectors who assume it is Ganoderma applanatum), this tough, perennial polypore causes a devastating heart rot in living ash trees across the continent. It is particularly common on white ash, but is also found on other ash species and, sometimes, on other hardwoods. Perenniporia fraxinophila does, indeed, look like the well-known "artist's fungus," Ganoderma applanatum. It features a brown to black upper surface that becomes cracked and furrowed, a white pore surface, and extremely tough flesh. 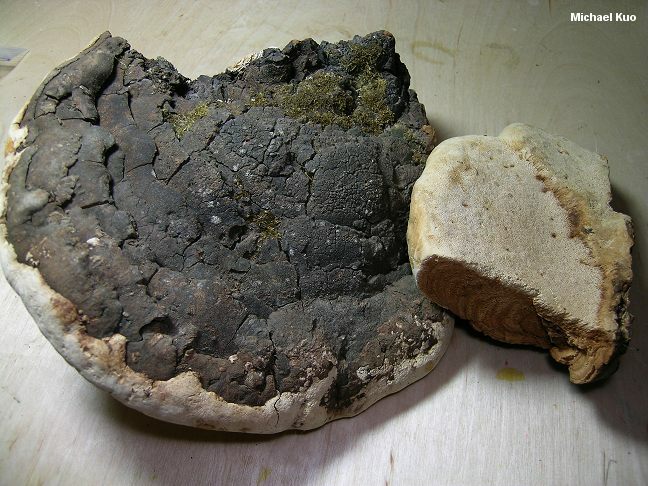 However, its pores are slightly larger, the pore surface does not bruise brown, and the flesh and tubes are brownish to pale brown rather than brown to reddish brown. The species also differ microscopically. Fomes fraxinophilus and Polyporus fraxinophilus are former names. Ecology: Parasitic on living ash trees (species of Fraxinus), especially white ash (also occasionally reported on other hardwoods); often appearing high on the tree; causing an extensive white heart rot; perennial; growing alone or gregariously; appearing year-round; fairly widely distributed in North America where ash trees occur. Cap: Usually clearly defined but sometimes merely a folded-over edge above a spreading pore surface; up to 40 cm across and 25 cm deep; convex to hoof-shaped; bald; brown to reddish brown, gray-brown, or black; becoming cracked and furrowed; often hosting moss or algae; the margin thick, rounded, and whitish. 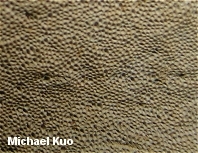 Pore Surface: Creamy white; not bruising appreciably; with 3-5 circular to angular pores per mm; tube layers to 5 mm thick. Flesh: Brownish to pale brown; corky to woody. Spore Print: Presumably white, but not documented. 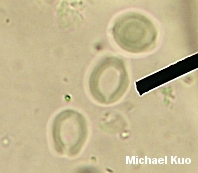 Microscopic Features: Spores 6-9 x 5-6 µ (but cited, perhaps erroneously, as 9-11 x 6.5-8 µ in Gilbertson & Ryvarden 1987); smooth; elliptical, with a severely truncated end; hyaline in KOH; in Melzer's sometimes faintly or strongly dextrinoid; thick-walled. Cystidia absent. Hyphal system dimitic. REFERENCES: (Peck, 1882) Ryvarden, 1972. (Saccardo, 1888; Overholts, 1953; Gilbertson & Ryvarden, 1987.) Herb. EIU Schanzle 2/20/1969; Zaloudek 11/18/1974.